"Long Dark Tea Time of the Soul"
During the month of January the walls of Mocha Joe's Café were festooned with a bevy of images created by two artists who live together as a couple, Noah Wasley and Kelly Laughton. The work of both of these artists fit well together in a combined aesthetic. Apparently influenced by international underground comic illustration, Japanese animé and the visual world of tattoo art, a sort of Punk-Noir style informed both creative personalities, making it hard for casual viewers to discern by which hand each of the individual pieces were wrought. The works were hung in salon style, close to one another and from tabletop to ceiling, and had been amassed and combined so intensely that the back room of the café was absolutely filled with images. Among these were numerous depictions of skulls, angels and dark heroic figures. In fact, the layout of the works was reminiscent of a body covered in tattoos, with each not quite blending into the next. The artists have also covered themselves, to some extent, with their creativity, as Wasley is a trained tattoo artist who has transformed their artistic ideas into flesh, so that Laughton and Wasley are not only inventive artists but also walking canvases, at least to a certain extent. 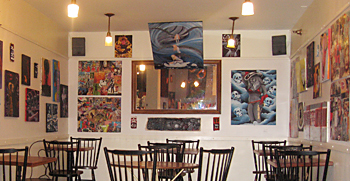 The show had the feeling of coming directly from the walls in their home to the walls of Mocha Joe's. Since Kelly works in the Café, she was around much of the time to help explain the works, or to designate by which of the two partners each one had been made. But the mystery of the overlapping styles was one of the compelling elements of the exhibition. From the entrance to the Café and from the "Brew-line," one could see a small, intense painting of a large pair of eyes staring out from over the couch, compelling visitors to enter the back room, the traditional gallery space. The Hindu-like staring eyes were painted on a blue background, lightly decorated with a transparent pattern over the surface. These eyes became a subject of conversation in themselves and successfully captured the viewer enough to enter the back room and be enveloped in a personal iconography of symbolic images, both emotional and superstitious, dark and spiritual. Although, in his work inscribing tattoos, Wasley obviously has to be graphically clear and explicit, in the exhibition he seemed to take advantage of the opportunity with paint to be more expressive. One small painting, rendered in complimentary colors of glowing gold and royal purple, depicts a dark angel floating on a deep background. Her sensual, naked body raises one arm in celestial gesture. She has a golden halo and is wearing what appears to be a pair of knee-high black boots. Her long hair glows with the gold pigment, which also describes the expanse of her large, opened wings, filling the canvas from side to side. The dark spirituality of this piece is haunting and memorable. In other larger works, the theme of "dark angel" was exploited in both racy and elegant fashion. One of the interesting themes embraced by Laughton was seen in some works depicting South Sea style "tikis." One painting depicted a totem of three tiki heads, but another smaller one, of a single tiki seen in semi-darkness in the company of a fallen bright yellow flower, was more mysterious and intense. In this work, Laughton has reduced the composition to its essential elements. The tiki, a clean, graphic rendition of a stylized skull, is dramatically lit, one half in semi-darkness, the other in semi-light. The darker side has been reduced to a few lines identifying the skull's features, and the abstraction works well. The single flower, below the skull on the left, is delicately rendered in yellow and orange, giving it a "golden" look. One raised petal might be beckoning to the viewer. The background is flat black. 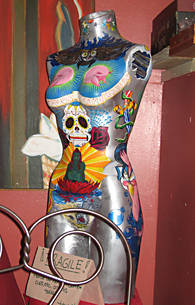 There's sort of a romantic Caribbean voodoo thing going on here; you might call it "punk-kitsch-mystical."